Now girls can have out-of-this-world dress-up fun with their favorite 18-inch doll! Fin Fun’s Lunar Tide doll tail set includes both a mermaid tail and top. Doll not included. 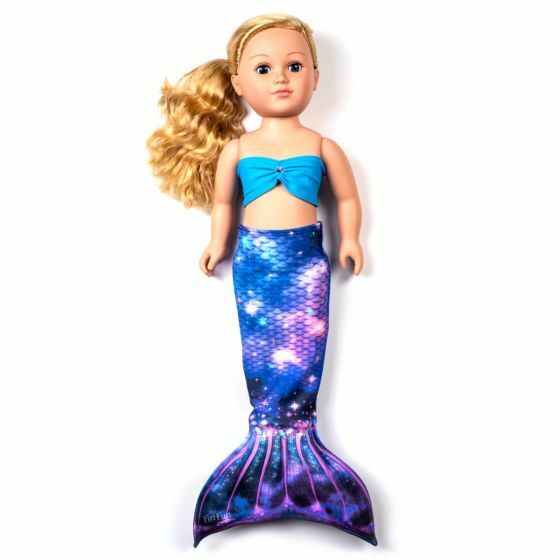 Add an extra element of make believe to your child’s playtime routine with a galaxy mermaid tail set designed just for her 18-inch doll! Imagine the mermaid adventures she’ll experience with her doll, immersed in “far out” world of make believe. Made of the same stretchy swimsuit material as other Fin Fun mermaid tails, this doll tail set for mermaid lovers makes the perfect gift for those who dream of life under the sea (and among the stars)!